A hero with a sharp, pointy nose... A heroine with a sweet face... A hero who’s a tall, strapping fellow... A heroine whose complexion glows with youth... Individually Shraddha Kapoor and Aditya Roy Kapoor are attractive enough. Together though, they face a grave problem: there’s zero chemistry between them. The fundamental issue with Aashiqui 2 is that the leads look like a doting little girl and her fond elder brother, NOT a couple desperately in love. The Internet tells me Aditya is 27 and Shraddha is 24. The real-life age difference of merely three years is irrelevant though because Shraddha looks like a kid in her mid-teens whereas Aditya has the face, body and demeanour of a full-grown man. Watching her swear undying devotion to this adult human male somehow brings back memories of that asexual kiss SRK planted on Deepika’s forehead in Om Shanti Om…another fond elder brother…though he, of course, was dealing with a self-imposed hurdle: Deepika is 21 years his junior. It does not help that the actors in Aashiqui 2 seem to have been instructed to be as languid as possible in their performances, perhaps as an ode to Rahul Roy and Anu Agarwal, stars of the 1990 film Aashiqui directed by Mahesh Bhatt (his brother Mukesh is one of the producers of Aashiqui 2). The languorous style made sense back then because Roy and Agarwal didn’t have an acting bone in their bodies and this was the best way to camouflage their inability to emote. Aditya on the other hand has already shown a little bit of potential in Action Replay (though Guzaarish proved that the potential requires a firm directorial hand) and Shraddha has given us ample proof of her innate talent in her first film as heroine, Luv ka the End. Disappointingly then, their studied lifelessness in Aashiqui 2 is ultimately what makes this film a very sluggish affair to not remember. This is not the kind of film you would expect from director Mohit Suri whose last venture was the highly entertaining Emraan Hashmi-Prashant Narayanan-Jacqueline Fernandez-starrer Murder 2 in 2011. Whatever the flaws may have been in Suri’s previous films, a deliberate lack of energy has not been one of them. It seems that like the entire team of Aashiqui 2, he too is labouring under illusions about the greatness and legacy of the old Aashiqui. Let’s face it: that film was no Mughal-e-Azam. It was a boring film with a boring hero and heroine who got lucky at the box office because of Nadeem-Shravan’s memorable soundtrack filled with melodious numbers that were a refreshing contrast to the noise reigning through Bollywood in the 1980s. So the referencing of Aashiqui in Aashiqui 2 comes across as inexplicable since the earlier film is not a classic. 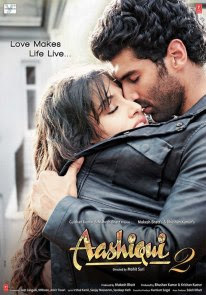 The shot of a girl and boy with their heads under a jacket was on the poster of Aashiqui. Yeah yeah we remember it, but that does not make it iconic. Replicating it in Aashiqui 2 then kind of seems silly. The songs in this new film are not bad at all, but since the past two decades have been good for Hindi film music, they’re not dramatically striking either. Here in a nutshell is the story of Aashiqui 2: Rahul Jaykar (Aditya) is a major pop star whose alcoholism is ruining his career. One night after a drunken brawl at one of his concerts, he spots Aarohi Keshav Shirke (Shraddha) singing one of his compositions at a beer bar in Goa. Struck by her amazing voice, he decides to mentor her and give her the career he’s no longer interested in having for himself. Some misunderstandings follow. Then the misunderstandings are sorted out. Then they work together. Then she becomes a star. Then he struggles with his love for the bottle. Then she stands by him. Then this. Then that. Then a yawn here. Then a yawn there. It’s dull dull dull. Since I’m indulging in so much wishful thinking here, I may as well add: this could have been a film. It’s not. What it is is a schoolboyish collation of randomly selected scenes through 140 minutes that feel like three hours. The editor and director seem to have lost interest in Aashiqui 2 somewhere in the first scene. No idea why they stuck around. this review was absolutely worth the wait, Ma'm! Loved the review. And u r right, Aashiqui was huge just because of the songs...thats that! what to say about when the review itself starts with "A hero with a sharp, pointy nose... A heroine with a sweet face... A hero who’s a tall, strapping fellow... A heroine whose complexion glows with youth..."
This lady has lost it I guess.OMG!!! She should have slept at her home instead of yawning & bothering to watch and post her pathetic review on this movie.Woho Aditya and Shradha didn't have chemistry Seriously I really need a defination of it from this reviewer.Its so sad that even the critics have been accustomed to all the eroticism shown in the movies.Am sorry that's probably the only pliable explanation that this lady claimed that there was no chemistry b/w the leads.Aditya and Shradha had incredible chemistry in this movie which was the USP of the movie and even the songs.Aditya did a fab job in the movie and Shradha did justice to her role.Aditya was flawless but yes Shradha needs a little polishing in her acting skills. MISS.REVIEWER ONE THING ADITYA AND SHRADHA SIZZLED ON-SCREEN,LOVE THEIR ROMANCE,CHEMISTRY,LOVE AASHIQUI 2 !!!! I wouldn't be that harsh. In fact, I liked the first act. Second act is mediocre. The worst offender, though, is the third act, where the film becomes an incredibly melodramatic and manipulative affair. Aditya Roy Kapur and Shradda Kapoor give decent performances. Songs are fine but 'Tum Hi Ho' and 'Sun Raha Hai (Male)' get repetitive and irritating after a while. Overall, it is a ridiculously overhyped, dull, boring film with one of the most overrated soundtracks in Hindi film history in my opinion. 2/5.